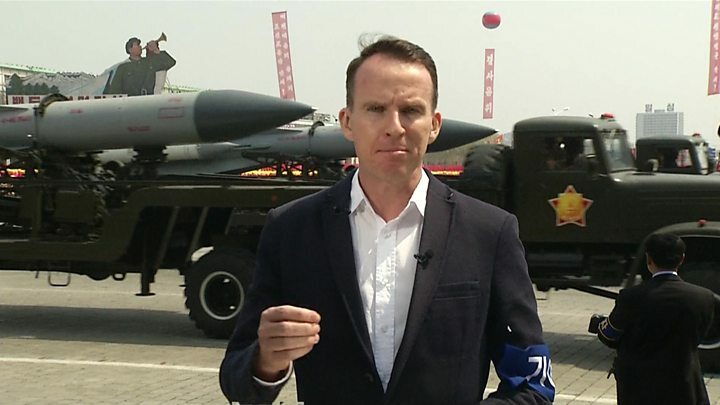 The US and China are working on a "range of options" on North Korea, the US top security adviser has said, as tensions mount over the country's nuclear and missile programmes. Lt Gen HR McMaster told ABC News there was consensus with China that this was a situation that "could not continue". The comments come after a failed missile test launch by North Korea and a massive military parade. President Trump had earlier said China was "working with us" on the issue. Beijing, Pyongyang's biggest ally, has come under pressure from Washington to exert more pressure on its neighbour. Sunday's comments appear to be the first confirmation that both countries are working together on how to deal with the North Korean issue. Gen McMaster, who was in the Afghan capital, Kabul, said the latest launch "fits a pattern of provocative and destabilising and threatening behaviour". "The president has made clear that he will not accept the United States and its allies and partners in the region being under threat from this hostile regime with nuclear weapons," he said. "I think there's an international consensus now, including the Chinese and the Chinese leadership, that this is a situation that just can't continue." President Donald Trump and Chinese President Xi Jinping discussed North Korea during a meeting last week. Mr Xi offered co-operation on "communication and co-ordination", the BBC's Robin Brant in Shanghai reports. Earlier on Sunday, South Korean and US military officials said a North Korean missile had detonated soon after launch. The US Pacific Command said it believed it to be a ballistic missile. Investigations were continuing, but one unnamed US official said it was unlikely to have been an intercontinental (ICBM) missile. Ballistic missiles follow high trajectories and are initially powered and guided, but fall to their target under gravity. ICBMs follow a sub-orbital trajectory, others stay within the atmosphere. North Korea's aim is to be able to put a nuclear warhead on an ICBM that can reach targets around the world. 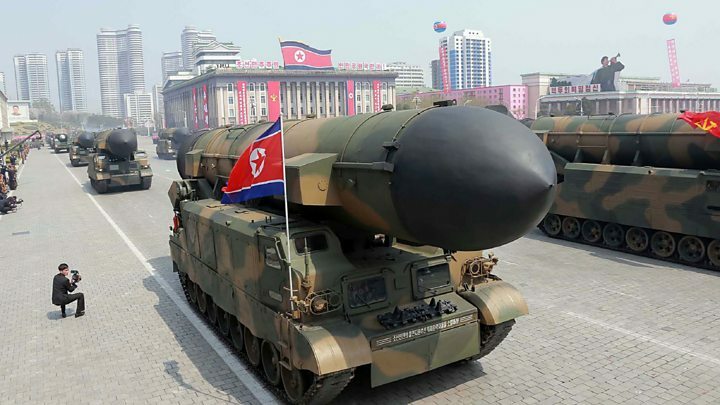 Pyongyang has claimed to have miniaturised nuclear warheads for use on missiles, though experts have cast doubt on that given the lack of evidence. The state has already conducted five nuclear tests and a series of missile launches in contravention of UN resolutions. It has suffered test failures in the past but they have not deterred its development programme. Meanwhile, US Vice-President Mike Pence is on a 10-day tour of Asia intended to reassure allies of US commitment to their security. In the South Korean capital, Seoul, Mr Pence called the failed launch a "provocation". He is set to discuss North Korea with acting President Hwang Kyo-ahn. UK Foreign Secretary Boris Johnson meanwhile issued another warning to North Korea after its failed missile launch. "They must stop these belligerent acts and comply with UN resolutions," he said. On Friday, China's Foreign Minister Wang Yi warned that the situation in the region was escalating, and that "conflict could break out at any moment". Adding to the tension in the Korean peninsula, a US aircraft carrier group is steaming towards the region. Video How do you solve a problem like North Korea?